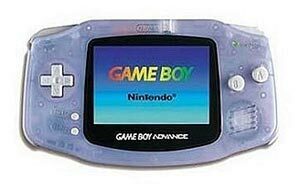 The original Game Boy Advance allows you to play all of your favorite Game Boy, Game Boy Color, and Game Boy Advance games on one system! The GBA arrived promptly but on close inspection before I handed it over to my son I looked inside the cartridge chamber and noticed some gunk (adhesive?--something gummy) that was blocking one of the "prongs" (not sure what to call that). It was very hard to remove this as it was sticky and pressed down into the hole--it took an hour of carefully extracting it using a thin piece of wire dipped in a scant amount of alcohol.) I also noticed the screws holding the unit together were corroded (not a big deal, but it made me wonder the condition the machine had been kept in in its first life.) "Refurbishment", I found myself wondering, might just be the replacement of the plastic door over the battery compartment (is a different plastic) since I saw no signs of love to the unit anywhere else. HOWEVER, all that said, with a bit of elbow grease, it works fine and my son is satisfied with it. And the price was certainly right. (But I admit I would have paid a tad bit more not to have to clean a gummy blob out of the cartridge chamber.) Hopefully they check other units more carefully than they did ours and this was just a bizarre glitch (like when they tested it an adhesive label somehow got caught in the game insert space.) If I could split star reviews I would give three to "condition arrived in" and four to "works well enough for us to feel we got our money's worth." Fast shipping, Like new quality, will buy again!!! Gba arrived on time with a new screen. Everything working great. I get all my retro gear from Lukie Games,they have the best prices I've found. I've been a customer off and on for the last five years. Lukiegames has always been synonymous with quality. My Game Boy Advance came in great condition (for a eighteen year old handheld), and all the games I ordered were in great shape as well...even the stickers were unblemished! I am happy with my purchase, and thanks for allowing me to play the games I grew up with! I have never been so impressed that I've taken the time to write a review for anything, but holy cow! At first I was extremely skeptical about ordering anything and I thought all the positive reviews were paid, but I gave it a shot and I'm not disappointed. Shipping was fast and everything arrived when they said it would. The system is in impressive shape and I ordered five games to go with it and the system works perfectly, the sound quality is great, and the buttons are like new. They even included batteries! ALL the games I bought work great and I'm just beyond impressed! My son is going to flip on his birthday. I will definitely be ordering from Lukie Games again and again. Works well, with no problems. My own GBA, in fuchsia, pooped the bed after all these years, and I had JUST gone to the Retro Gaming Expo to buy some games for the Ol' Gal. Enter LukieGames. I didn't want to take a chance with some skeeze-bag on Ebay, and LukieGames had SO MANY good reviews. I took the plunge. 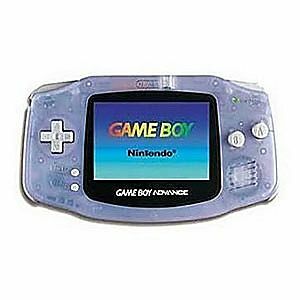 not just with a GBA (in cool-a$$ GLACIER), but a handful of games. I was honestly taken aback by: the games are tested for functionability; and: they included BATTERIES in the thing--really! I expected a shell; AND, ALL THE GAMES WORKED. No issues. Seriously, I don't get overwhelmed often, but I was impressed. I turned my Best Bro on to you, and I hope he extends the love all the way out to HIS Game Community. Thank you, LukieGames. I am now slavishly devoted to you. Great customer service, I'm satisfied with my purchase. The screen is protected and everything looks good. I recommend. I am very happy with this product. It works perfectly and is exactly what I wanted. The price was reasonable and it arrived in a very timely manner. I am a happy customer. Works well just wish the screen wasn't so dark. Item is in great condition, plays perfectly, and made an excellent gift.